Bi Monday bargaining after management repeats same inadequate ‘offers’, while CICS strikers train for civil disobedience to free part of $36 million in hoarded public education dollars. 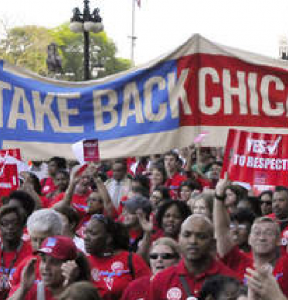 CHICAGO—Illinois’ Attorney General is being asked to investigate charter operator CICS, after the strike of four CICS schools moved into its second week. Strikers will rally today at 1PM outside of the IL AG’s office at the Thompson Center, 100 W. Randolph, then send a delegation inside with a letter detailing the need for an investigation into CICS finances and structure. CICS has siphoned off $36 million in public dollars above and beyond either mandated reserve funds or set-asides for bond payments that CICS refuses to apply to settle the strike. Some of those funds have been invested in insider deals, at the same time that CICS has jacked up management fees 25% this year alone within a nesting doll structure of management companies that CICS owns. This year’s $1.2 million increase in ‘fees’ could settle the strike, but management has balked at putting those public dollars into classrooms. Strikers will head from the AG’s office to CICS’ corporate headquarters at 11 E. Adams. On Monday, strikers attempted to send a delegation up to the offices of CICS CEO Elizabeth Shaw, who has refused to release even a fraction of the $36 million her administration has hoarded from public education dollars that were supposed to go to school communities. Strikers were locked out of the building and threatened with arrest. Strikers will also train for civil disobedience today, in an effort to ratchet up pressure on Shaw and the charter outfit, which has repeatedly come into bargaining in the last week with an ‘offer’ strikers call an insult to educators and an attack on students’ educations. Striking teachers and paraprofessionals at the four CICS schools will again be on the picket lines starting at 6:30 AM today, in their battle for living wages, decent working conditions and adequate resources for the schools’ overwhelmingly Black and Brown low-income students. 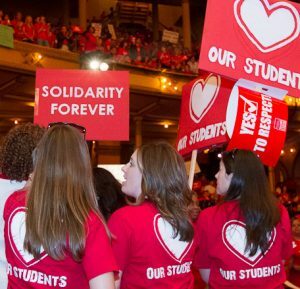 Bargaining remains stalled, with management insisting that raises for low-wage workers, some of whom make less than $30,000/year, must be tied to larger class sizes, increasing already too-high counselors’ loads and zero commitments against cuts to staffing or under-resourced student programs. Strikers refuse to accept this ‘trade’. ratios for counselors and maternity/paternity leave. Strikers blasted management for what they described as a ’tissue of lies’ in a video they released before they picketed CICS’ corporate offices Monday. CICS has offered an 8% average raise in the first year of a new contract—not the 31% management has falsely claimed. The proposal would leave staff salaries well below CPS levels of compensation for the entire four year agreement. The strikers are asking for equal pay with their CPS peers.